Audiology Devices Market size was valued over USD 7 billion in 2016 and is expected to witness more than 5% CAGR from 2017 to 2024. Increasing prevalence of hearing loss disorders will drive audiology devices market growth over the forecast timeframe. Hearing loss causes significant reduction in quality of life as well as ability to learn and earn. As audiology devices improves hearing ability and enhances quality of life of patients, its demand will increase with the increasing prevalence of hearing loss disorders. Favourable government initiative such as OTC hearing aids act will augment audiology devices market growth. The act was implemented with an aim to increase the affordability and public accessibility of audiology devices with over the counter availability of hearing aids. Stigma pertaining to the wearing of audiology devices such as hearing aids coupled with increasing concerns regarding the aesthetic appeal will impede the industry growth to some extent. Individuals with aesthetics concerns are increasingly demanding hearing aids that are smaller in size. Hearing aids accounted for largest market share in 2016 and forecasted to follow similar trend over foreseeable future. Technological advancements leading to development of hearing aids with greater efficiency and smaller size coupled with low cost of device compared to cochlear implants and bone anchored hearing aids will contribute to the segment growth of audiology devices market. Hearing aids are available in different types that includes in the ear type, behind the ear type, receiver in the canal type and canal hearing aids. Canal hearing aids are the smallest in size. Demand for this type of hearing aid is steadily increasing with growing concern pertaining to aesthetic appeal. However, difficulties in handling and maintenance of these type of device is expected to hamper its growth over forecast timeframe. Cochlear implants segment will grow at a robust CAGR over the forecast timeframe. 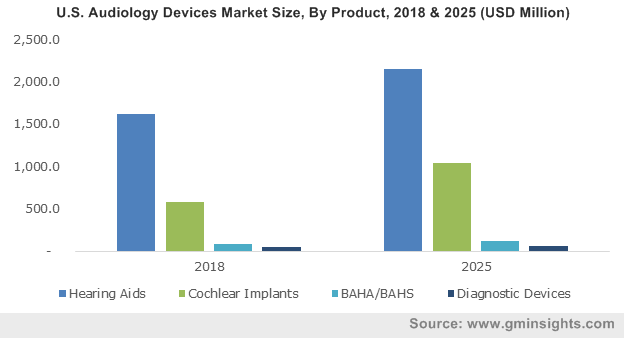 Currently, cochlear implants market penetration is significantly low compared to hearing aids but increasing awareness regarding the ability of cochlear implant to improve hearing capability will support the segment growth over the forecast period. High cost and limited awareness are forecasted to hamper cochlear implants segment growth to some extent. U.S. audiology devices market accounted for largest regional share due to increasing prevalence of hearing disorders. Around 20 percent of U.S. population experience certain degree of hearing loss. Hearing disabilities are more prevalent in the U.S. population aged over 65 years. The industry growth is further supported by regional availability and increased affordability pertaining to technologically sophisticated audiology devices. Favourable reimbursement scenario covering the cost pertaining to the audiology devices will boost the U.S. audiology devices market growth over the forecast timeframe. UK dominated European audiology devices market and trend is expected to continue over forecast period. Increasing geriatric population vulnerable to range of hearing disorders will augment U.K hearing loss devices market growth. More than 11 million people in UK experience some degree of hearing loss and the number are predicted to increase to 15.6 million by 2035. China audiology devices market is expected to grow at a robust CAGR over forecast timeframe due to presence of large patient pool. Increasing government support coupled with developing healthcare infrastructure will drive the industry over forecast period. However, low levels of awareness pertaining to advanced audiology devices will impede industry growth to some extent. 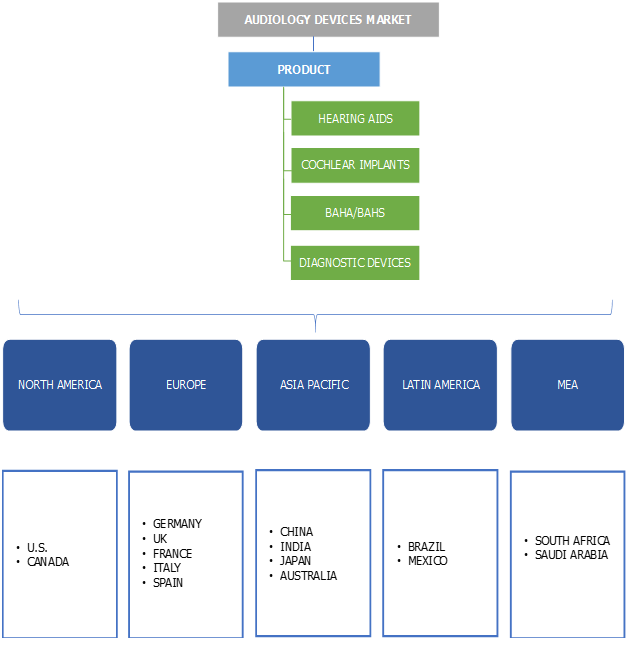 Some of the major players of global audiology devices market are Sivantos, WIDEX, William Demant Holdin, Sonova Holdings, Benson Medical, Medtronic, Starkey Hearing Technologies, Advanced Bionics, MicroTech, GN Group, MED-EL, MedRx, Nurotron Biotechnology, and AMBCO. Industry players are increasingly focusing on development and launch of technologically advanced and cost-effective audiology devices. For instance, in February 2017, Sanova Holding AG launched a broad range of innovative products such as Bolero B-PR, and Virto B-Titanium. Increasing geriatric population across the world coupled with the stupendous increase in hearing loss disorders will drive global audiology devices industry. Technological advancements, product innovations and favourable regulatory scenario will further escalate industry growth over the forecast period. The industry is expected to witness robust growth supported by increasing awareness and adoption rates of advance audiology technologies available in the industry. Increasing number of people with hearing loss diseases in developed countries such as U.S. and ongoing research and product development form leading industry players is one of the major driving force. The market is currently underpenetrated in developing economies. However, gradually increasing adoption and developing healthcare infrastructure will favour the industry growth in developing region such as India and Brazil.